So a while ago, my friend Corbin and myself decided that we wanted to try an experiment. We would make a podcast. Whether that had anything to do with the fact that we had just finished listening to a hilarious podcast about the band U2 is beside the point. It’s always be on my bucket list to do something in radio, whether that’s being on an actual radio show, which I got to do earlier last year, or start a show of my own. I figured that starting something up on my own would take more work than it was worth. I was kind of right. This is the genesis of our little experiment. Well, it’s that time of the year again where I celebrate something that New Zealanders do not. Thanksgiving is such a huge part of my childhood. Growing up in my family, Thanksgiving consisted of giant family dinner’s, complete with all the relatives, smells of stuffing, green bean casserole, and turkey, catching up on a years worth of activity with aunts, uncles, and cousins, playing football in the backyard, kids running around the floor and into the basement, and either Detroit or Dallas playing on the TV. Also there is laughter…so much laughter. My family is a laughing family. We indulge in a good story, embellish for the chuckle, and deliver for the howl that resonates our walls. Usually we end the night with a board game, which my Dad does not like. Still, it’s a tradition to play one every year. I love my family. This has to be said. I miss them like crazy and I know that they miss me too. They are the most caring, loving, thoughtful, hilarious, wacky, and joyful group of people that I know. If you’ve spent any time with a Peterson, Birkey, or Soraich, you would know. You would know because our family is one of a kind. They have supported me through thick and thicker, and I have been blessed beyond what I deserve when I was raised by Sharon and Russ Peterson. As a kid I always wanted a brother, but I now know the true gift in growing up with two sisters. For one, I have been exposed to the…rougher sides of living with women, haha. But in all seriousness, I am thankful that Robyn and Nicole have been there, no matter what, encouraging me through school, through moving, and through distance. I know it hasn’t been easy, but I love you so much. I am thankful for family that doesn’t change, regardless of the miles in-between. Such solid memories were made in those years when we all got together to eat, talk, laugh, and reminisce. They were happy times which I take with me everywhere I go, no matter the distance. It’s in times like these that traditions hit me the hardest. I know that this year will be different, just like the last. There’s nothing I can really do about that, other than making new traditions. Life moves and turns and grows when we’re not looking. Don’t blink. Which is why I am thankful for the now. I’m thankful for my flatmates, friends, and mentors who are making it easier for me here, now. If you feel like it, let me know what you are thankful for in the comments and why. Share it around and spread the cheer. And thanks to everyone giving. You are the backbone of altruism and the human spirit. I love you and thank you. Two nights ago, I started doing something that I haven’t been able to stop. I started writing about my past. I started writing down any and all memories that I could think of, unhindered and unfiltered. I then started to categorize them into Good, Neutral, Bad, and Good/Bad memories. I can’t really explain why I started doing this, but I haven’t really been able to stop writing for about two days now. Any free time I get, I jot down a memory that comes to me, which will lead to another memory…so on and so forth. The process has been incredible. All of these memories are inside my head, just filed away somewhere and pulling them out/recalling the details of events has been both challenging and incredibly therapeutic in some ways. This is an exercise that I would recommend to my clients. I just decided to do it on my own for whatever reason. The memories I choose are generally before high school, as in, any time after high school seems closer to “recently happened” rather than “past”. Semantics. I would say that about 98% of my memories are things that I would be able to share with my two sisters and parents, as they are all characters in said memories. 1% of my memories they don’t know because only I experienced them, and the last 1% are memories that I don’t see myself telling anyone. Some things belong in memory. I have written about 11 pages so far, or 6,500 words, and if I had to do maths on what I’ve done, I could probably write another 20-30 pages (12-18,000 words). It goes without saying that I am not going to start posting my memories to everyone, as that cheapens my experiences and I’d like to share those with someone special someday….not the rest of the world. Still, there is an example memory that I can share with you all, and I think it accurately reflects my process. Enjoy this memory of mine, circa August 1999. Once, my family and the Zehrs, a family I grew up with knowing and hanging out with, took a vacation to Michigan. It was Robyn, Nicole, and myself in my family. Ashley (Nicoles age) Alaina (my age) and Allie (Robyns age) in the Zehr family. We rented a beach house somewhere off Lake Michigan. I still remember pulling up to that house. Turquoise in color and fully awesome. I ran into the house and threw my stuff on the bed that I called dibs for. I then ran to the backyard…we had a HOT TUB! This was awesome. I was never allowed in the hot tub before. We jumped into our suits and ran down the beach. Freshly sun screened and eager, we marveled at the size of the waves. Equal parts frightened and gitty, we made sandcastles, sand towns, rivers of water, and sand angels. We burried each other, and swam in the lake to wash off. 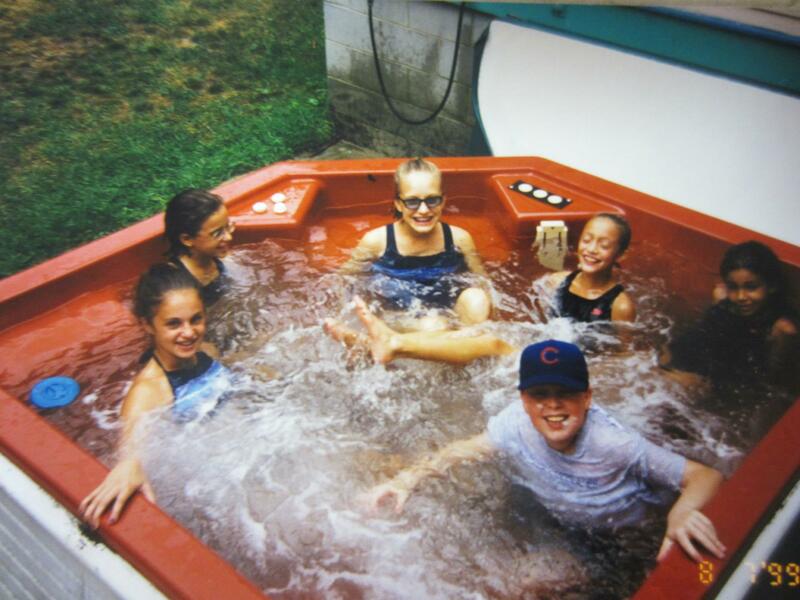 We ended up in the hot tub, me with my cubs hat and shirt still on, the others being crazy…which was business as usual. I remember that house being so beautiful and reeked of “summer” with scents of sunscreen, bugspray, and BBQ. The house even looked like summer with shells everywhere, rope, sailing pictures, fish art pieces, wicker furniture, plenty of windows to let the sunlight in, etc. I loved it. Our families took turns cooking dinner, and we would all congregate around the big glass table to eat. Unrelated, but this is around the time that Prince of Egypt came out, and I was listening to the soundtrack the entire trip, ha. Loved that movie. To this day, both the Peterson family and the Zehrs remember fondly on that trip and how incredibly relaxing/fun it was. It was a golden week. Untouchable. It is said that there are about 2.3 billion ‘moments’ in the average lifetime of a human being. Why that precise? In the average life, there are 2,366,820,000 seconds, 39,450,000 minutes, 657,436 hours, or 27,393 days for those moments to happen. Moments are made every second. They say that someone is experiencing something incredibly significant on the planet at all times. No video could more accurately appreciate the seconds in this lifetime more than Andre & Markus at “The Beauty of a Second” vimeo channel. Here they really convey how precious the moments that we have in life truly are. Additionally, they prove how tragically and at the same time beautifully fleeting this life really is. Finally, I wish to show you, the readers, an incredible “life art project” in where the filmmakers, musicians, artists, politicians and cats…I’m quoting them on that one…, kut, come together to create a moment. The video is truly beautiful as they attempt and succeed in creating an artificial environment in an otherwise impossible situation. I like this philosophy. When you have an idea that will make people laugh, scratch their heads, giggle, play around, look like fools, or wonder…then MAKE that moment happen, don’t wait for it to fall into your lap. And that’s exactly what these people do. All of the stories and moments that you found on this blog post today were originally found at the Incredible website Colossal. I would recommend checking it out and having your mind blown each week. Additionally, if you want to check out more moments in life, there is an ENTIRE ARMY of people doing this very thing in New York City called “Improv Everywhere.” These people are creating, most times hilarious, life moments every. day. Enjoy.